Wholesome natural hypo-allergenic dog food. 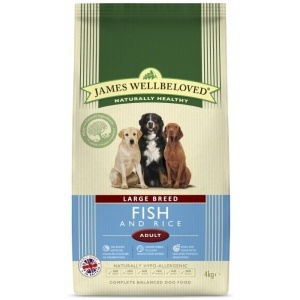 James Wellbeloved Fish and Rice helps loose bowels and calms itchy irritated skin and coat. The delightful fresh taste of James Wellbeloved dog food is one that dogs love. Low in histamine, white fish is also high in omega 3 fatty acids which are vital for maintenance of optimum health. The necessary dietary fibre is provided by peas and chicory something different for our Ocean White Fish & Rice diet. Olive oil is not only delicious but also has a high mono-unsaturate content compared to other oils and is well known as part of the healthy Mediterranean diet.